It’s rare for a game to cover a great work of French literature; the likes of Jean-Paul Sartre, Victor Hugo and even the great Alexandre Dumas were all strangely ignored by master system programmers. Luckily for us masers Goscinny and Uderzo were covered in no less than three Master System games and this is the pick of the bunch. The games basic story is that Getafix, the village's druid, needs some magic herbs to cure a cold which is hampering the use of the magic potion that gives the warriors the magical strength to defeat the Romans. So, off go Asterix and Obelix to once again save their village. The game takes the basic platformer genre and adds various other elements to keep gameplay fresh. Other than the standard jumping on things heads to kill them, vaulting from platform to platform and breaking blocks the game adds some brilliant strokes such as continually scrolling level which only ends when you figure out the puzzle, levels containing doors that lead transport you all over the level and an utterly brilliant surfing level. What's more each level gives you the choice to play as either Asterix or Obelix which gives the gameplay a dual challenge. The graphics of the game capture the feel of the comics superbly, but the stills of the game simply do not do it justice, the way in which the characters move bears an incredible likeness to Albert Uderzo's style, from Obelix's waddle to Asterix's punching style. One of the particular highlights graphicly is the way in which enemies react to being hit, the roman soldiers in particular look brilliant when destroyed often pulling faces and moving into funny positions. However its not only the character animation that excels in this field, the backgrounds and locations for the levels are also true to the comic books, from the outskirts of the village to beautiful snow planes, ancient Egypt and old favorites like the Pirate ship. 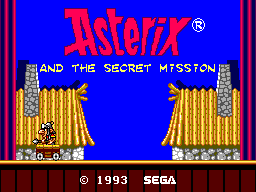 The sound of Asterix and the Secret Mission is, like so many other Master System games, its weakest area. However the game does posses some very catchy tunes, the problem is that these tunes are relatively repetitive and of slightly too high a pitch to ever be enjoyable. The saving grace of this area is the brilliantly slapstick sound effects, including a quite odd springing noise when facing a jumping horse. On a basic level the controls of the games pose no problems; jumping, attacking and moving are all at the right sort of speed and take no adjustment for anyone who enjoys platformers. The reason I rate the controls so highly is the sheer variety of moves you can get out of the two buttons and directional pad. 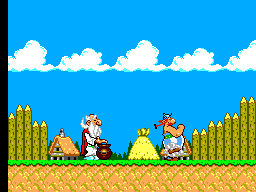 Whereas classics like Sonic simply allow you to jump, Asterix and the Secret Mission gives you a wide range of movement techniques: Asterix can double jump and use a falling fist attack and Obelix can head but objects above him and quite hilariously seems to use his bottom to attack almost as much as his fist, by simply pressing down when jumping Obelix will flatten opponents and if on a slope of any kind he will slide along on his bum a little faster than he normally walks. Asterix and the Secret Mission is very good value for money. Not only is it a good game with a very balanced difficulty level and learning curve, thus giving you a reason to come back, but every level gives you the option of playing as either Asterix or Obelix. The difference between this choice and similar choices in other games (think Sonic Chaos) is that this choice makes a very large difference to the gameplay, some of the levels are entirely different and even the ones that aren't ensure that you use the characters strengths to finish the level, for example in one level you can either use Obelix to swim to your goal or use Asterix to fit through a small gap and get a potion to evaporate the water. All in all I feel Asterix and the Secret Mission is one of the highlights of the Master System's catalogue. The gameplay is genuinely enjoyable and the learning curve is balanced fantastically, so you are gently eased into the game with the game becoming successively more challenging without becoming irritating. 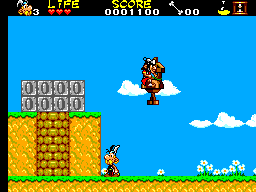 Other than the fact I simply see Asterix and the Secret Mission as a good platformer which improves upon the original, the game's biggest success is that it so perfectly captures the humor of the comics without breaking up the gameplay with too much text or speech bubbles that could affect the speed of the game.